Wild Western © 1982 Taito. 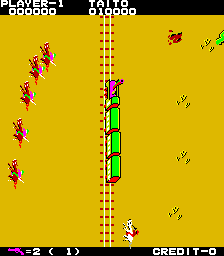 A sheriff on horseback must protect a train, located in the center of the screen, from groups of bandits. Players must avoid running into obstacles, getting shot, or allowing three bandits to board the train. A bonus game is played between rounds. Runs on the "Taito SJ System" hardware. Wild Western was released in May 1982. When a bandit gets on the train, use the Action button to get on the train to attack him. You can't shoot bandits who are on the train. When an obstacle approaches while you are on the train, press the Action button to duck. To get off the train, press the Action button when your horse is near. If you are hit by enemy gunfire, or if you run into cacti, rocks or the train, you will lose a life. The game ends when all lives are lost or three bandits get on the train. After completing a stage, hit the coin tossed in the air and receive double bonus points. [JP] Sony PS2 (aug.25, 2005) "Taito Memories Gekan [Model SLPM-66092]"
Sony PlayStation 2 [AU] (mar.30, 2006) "Taito Legends 2 [Model SLES-53852]"
[EU] Microsoft XBOX (mar.31, 2006) "Taito Legends 2"
[EU] Sony PS2 (mar.31, 2006) "Taito Legends 2 [Model SLES-53852]"
[US] Sony PS2 (may.16, 2007) "Taito Legends 2 [Model SLUS-21349]"
[EU] PC [MS Windows, CD-ROM] (mar.31, 2006) "Taito Legends 2"
[US] PC [MS Windows, CD-ROM] (jul.10, 2007) "Taito Legends 2"